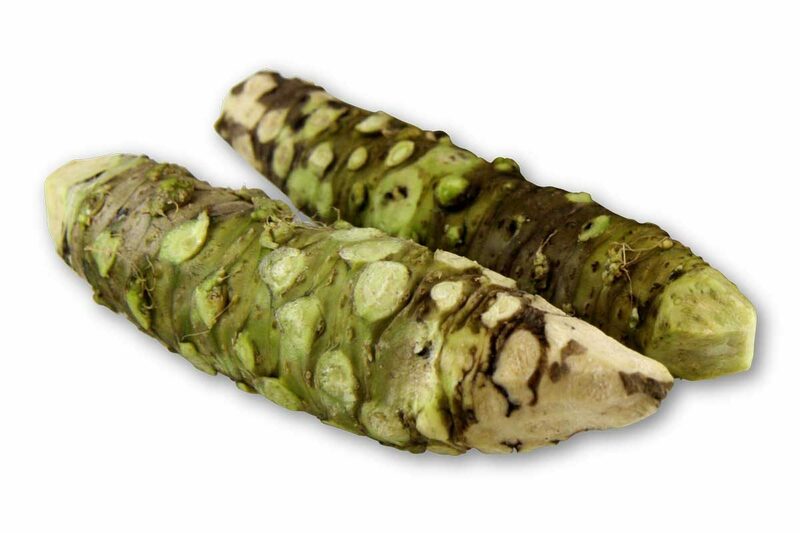 Fresh wasabi rhizomes (colloquially known as fresh wasabi roots) are a rare and precious culinary commodity prized by high level sushi and fine dining chefs. Fresh grating is key with fresh wasabi rhizomes. Below are instructions for how to get the best flavor out of fresh wasabi. Trim the tip off of one end. Put this end down, then use a knife to strip the outer peel off the end of the wasabi (try not to expose any more than you plan on using). Using the finest grater you can get your hands on, grate the wasabi root into a fine paste. In the picture below, we used a microplane, but a metal Japanese wasabi grater would be even better, with the best option being the traditional Japanese sharkskin grater (called “oroshi”). In a pinch, you could also use the finest hole size on a box grater. Form the wasabi paste into a small pile to minimize its exposed surface area. Use the fresh wasabi paste in the next 5-10 minutes for optimal flavor. Reviving wasabi: About 15-20 minutes after being grated, wasabi starts to lose some of its nuanced flavor, becoming simply hot. Its subtle flavor notes can be somewhat revived, however. Vigorously mix in 1-2 pinches of granulated sugar (we recommend superfine sugar) per teaspoon of wasabi paste. The paste will briefly regain some of its complexity. How to Store Wasabi Rhizomes: Store whole wasabi rhizomes in the fridge, wrapped in a damp (not wet) towel. Check the towel daily to make sure it hasn’t dried out and re-dampen or refresh with a fresh towel. Though they are often most potent in the few days after arrival, wasabi rhizomes can remain fresh for as long as three weeks if carefully stored.